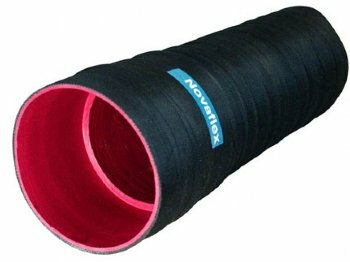 Rubber two-ply light duty material handling hose/rubberized ducting, wire reinforced. Constructed without glue, eliminating any potential de-lamination. A low pressure hose, designed to be extremely lightweight, but offer high flexibility and abrasion resistance in vacuum and discharge applications. Available in many other tube compounds. Integral soft cuffs available upon request.